Vintage botanical print of rice and millet. These grains are among some of the most important crops grown around the world. Rice is a primary food in so many countries. 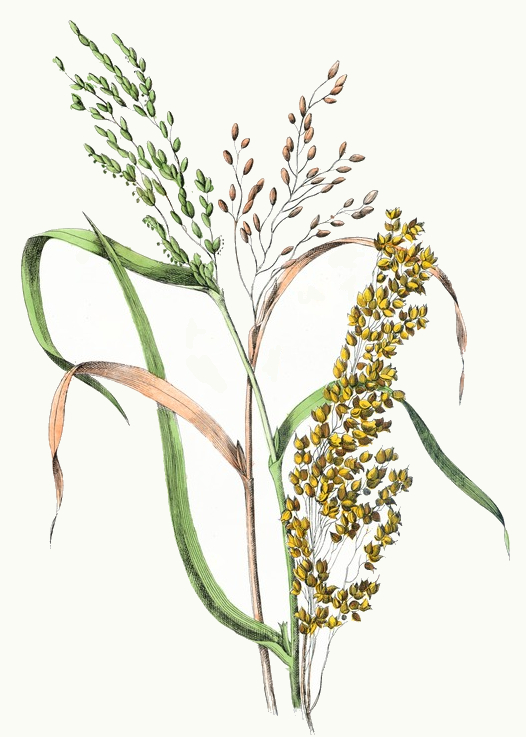 This drawing shows a young and green rice sprig as well as a ripened stalk. I’m not sure if the millet is fully matured or not. The colors of this botanical print work nicely together. The light greens of the young rice, the tannish pink color of the ripened rice and the yellow millet all make an interesting print that could easily be used along or in combination with other images. These vintage colored botanical prints are wonderful. The 1858 work Lessons From the Vegetable World had a number of them but unfortunately did not include information on the artist or watercolorist.